A man who bludgeoned a pensioner to death to find out his Personal Identification Number (Pin) has been jailed for life for his murder. Widower Fred Hodsdon, 69, was bound and beaten with a hammer at his home in Vespers Close, Luton, on 25 June 2011. 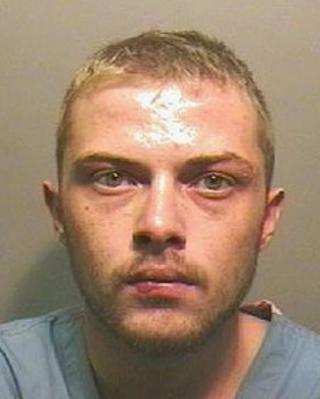 David Clairmonte, 26, of Thornview Road, Houghton Regis, was desperate for cash and just hours before had refused the offer of a psychiatric assessment. He was convicted by a jury and was told he will serve a minimum of 30 years. Luton Crown Court heard that in the hours before the attack, Clairmonte, an unemployed drug user, went to Luton and Dunstable Hospital with his aunt, who was concerned about his depression. It was decided that he did not represent a danger to anyone else and he spurned the chance of a three-day assessment at a psychiatric clinic as a voluntary patient. He then tried but failed to gain a loan via an online application on a Luton library computer, and turned up at Mr Hodsdon's bungalow. He had worked on Mr Hodsdon's roof in 2008 and knew he would be alone, the court heard. He bound the pensioner's hands with electricians' tape and led him from room to room, beating him 13 times around the face and head with a hammer he had found in the garden shed, the jury was told. The bungalow was ransacked and Mr Hodsdon's blood was found throughout. Clairmonte left Mr Hodsdon in a pool of blood and tried but failed to withdraw £100 from a nearby cash machine. Officers found him and the hammer at his home later that day. He denied murder and claimed he had stumbled across the "horrific" aftermath and had taken the hammer away from the scene because he had accidentally touched it. Sentencing Clairmonte, Judge Richard Foster said: "It's quite clear you went there planning to steal from that house and sell items. You tried to extract from him in that house details of his Pin number."